The Estonian Evangelical Martin Luther church in Gleason has experienced several instances of vandalism this year, owners said. GLEASON – Vandals splattered paint and painted a Satanic symbol inside a century-old Estonian church in Lincoln County. The incident on Thursday is just one of several instances of vandalism to take place since the beginning of the year at the historic Estonian Evangelical Martin Luther Church, which was built in 1914. Bill Rebane is one of the owners of the church, located at 1488 Estonian Church Road, and has been part of restoration efforts. Rebane said there have been six or seven instances of vandalism already this year, damaging everything from the pews inside the one-room church to removing the doors on the front of the building. But the latest instance, which occurred Thursday night, is the most disturbing for Rebane. Vandals splattered oil-based paint, made especially for the restoration project, across the walls, ruining a nearly $3,000 jade cross that hangs at the front of the building, Rebane said. A pentagram, often recognized as a satanic symbol, was painted on the walls with paint meant for refurbishing the inside of the Estonian Evangelical Martin Luther Church in Gleason. The Lincoln County Sheriff’s Department has placed extra patrols on the historic church to keep watch for vandals, said Lt. Tim Fischer. Deputies also are conducting an investigation into the damage, hoping to find a clue as to who is responsible. So far there haven’t been any leads. Paint covers a jade cross worth up to $3,000 in the Estonian Evangelical Martin Luther Church in Gleason. Vandals are believed to have thrown the paint on the walls last Thursday. 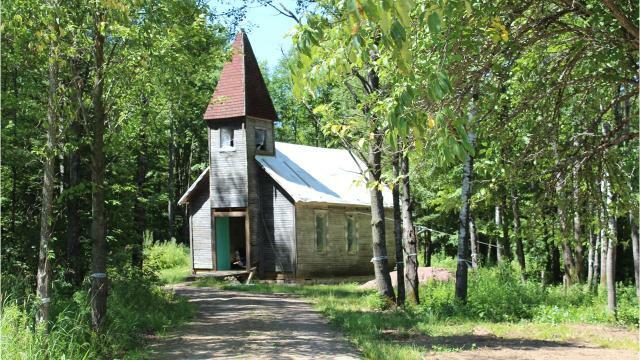 The tiny church was the first of its kind in America, according to the church’s website. It was built for the Estonian and Latvian immigrants who settled in Gleason, and has served as a reminder of that journey for visitors from near and far, Rebane said. Just last year, the church board was able to complete the restoration of the building’s foundation, lifting the structure off the ground and giving a more stable footing. This year, the roof was set to be replaced, but with the amount of vandalism, Rebane said morale is low and the project has been delayed. “It’s terribly disheartening now that the damages are mounting,” he said. All of the instances of vandalism have occurred at fairly regular intervals throughout the year, with about two to three weeks between each strike. To catch the vandals in action, should they return, the board of the church has placed trail cameras at the site. Footage will be handed over to the sheriff’s department, Rebane said. Rebane, who lives in the small Iron County town of Saxon, is known in northern Wisconsin as the director of the 1970s B-movie cult classic “The Giant Spider Invasion,” which was filmed in Lincoln County. The board will continue to press on with repairs this summer, and though the vandalism is setting the project back, Rebane believes the building will withstand the test. “It has withstood 100 years of winters, elements and everything,” he said. Do you have a tip on who’s causing damage? The Estonial Evangelical Martin Luther Church in Gleason has survived over 100 years of weather, but recently, vandals have been causing the building trouble.